Place butter and coriander into Thermomix bowl and blend 30 sec/speed 6, stopping to scrape down sides of bowl as needed. Form into a log shape and wrap and place in fridge until ready to serve. Combine lime juice, oil, sugar and chilli in small bowl and stir until sugar dissolves. Lay piece of lemon grass in the centre of a sheet of foil large enough to wrap one fillet. Place fillet on top and smear surface with the lime mixture. Top with lime slices and grated ginger. Wrap to secure parcel. Repeat with remaining fillets. Pour 1L water into Thermomix bowl. Place wrapped fish fillets into steamer tray and set Varoma into position. Steam fish approx 10-15 min/Varoma/speed 3 until fish is just cooked and flaking easily with a fork. 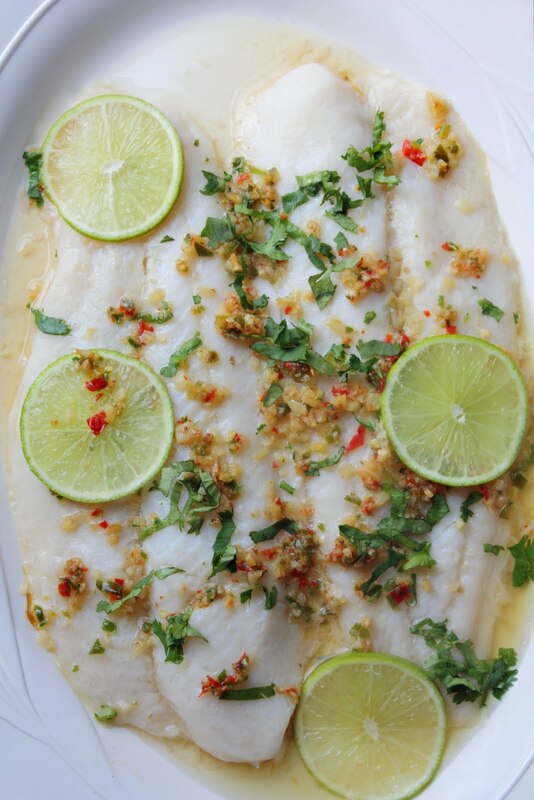 Slice the coriander butter and let it melt on each piece of fish, top with additional coriander leaves and julienned chillies, steamed rice and green vegetables.